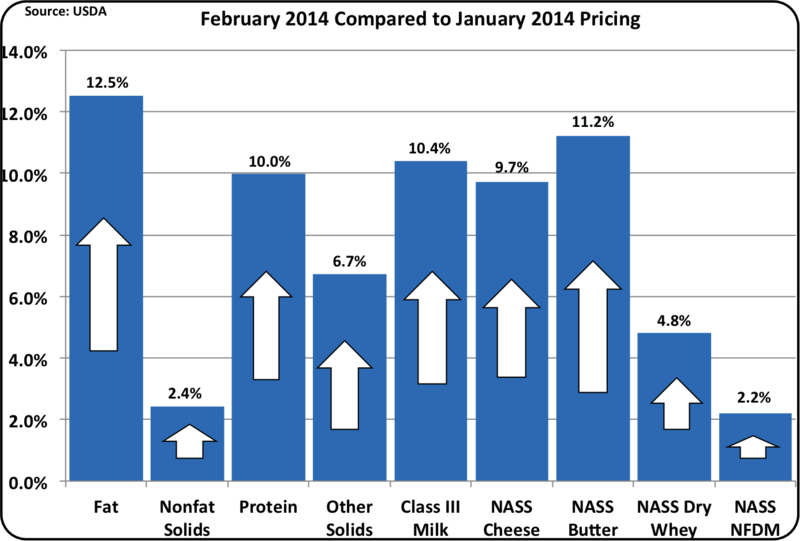 On March 4, the February 2014 Class and Component milk prices were announced. The Class III milk price, which is the basis of payment for the majority of milk produced in the U.S., hit a record high of $23.35/cwt. Every parameter tracked on the dashboard below increased in value. 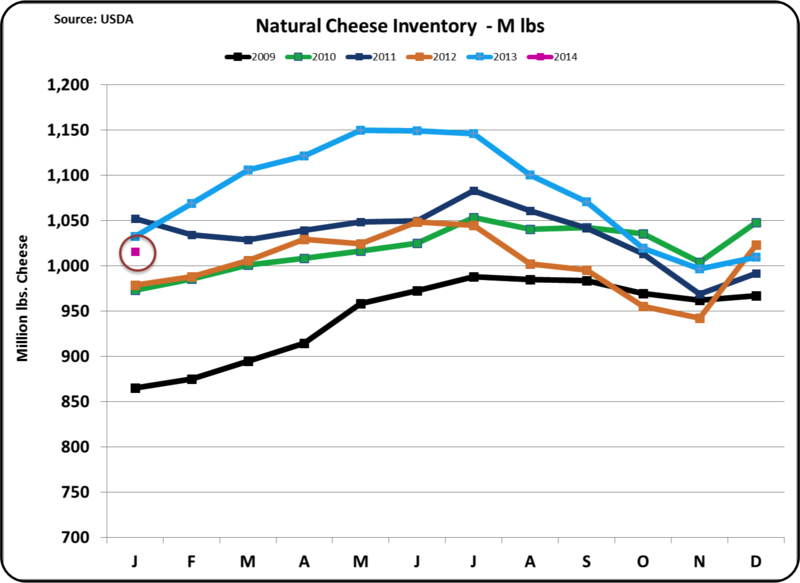 The Class III price is driven by the NASS cheese price, which was up 9.7% to $2.29/lb., a record high. The price of butter increased 11.2%, driven by very strong exports and very low inventories. All component prices were up. There were no records set for individual component prices, but all components had very healthy values. 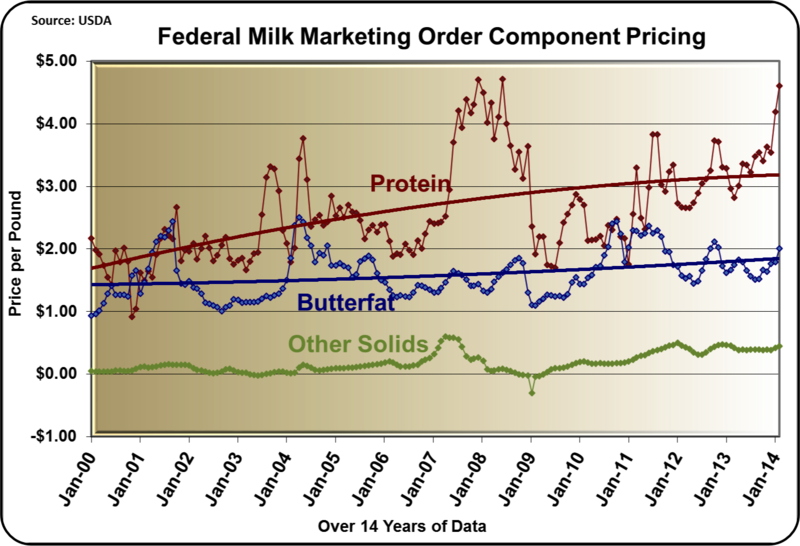 Protein was valued at $4.60/lb., butterfat at $2.01/lb. and other solids at $.45/lb. 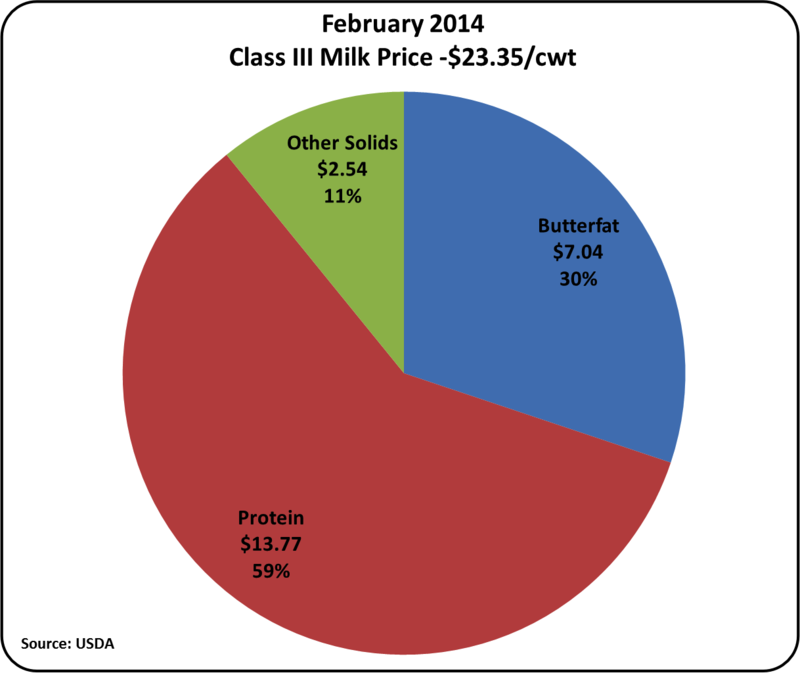 This led to a pie chart of component values with milk protein making up 59% of the standardized Class III milk price. The pricing of commodities that drive the milk component prices are influenced by the inventory levels of those commodities. Inventory data is available through the end of January. When February data becomes available, this post will be updated. Cheese prices primarily drive the protein price, butter prices drive the butterfat price, and dry whey prices drive the other solids price. 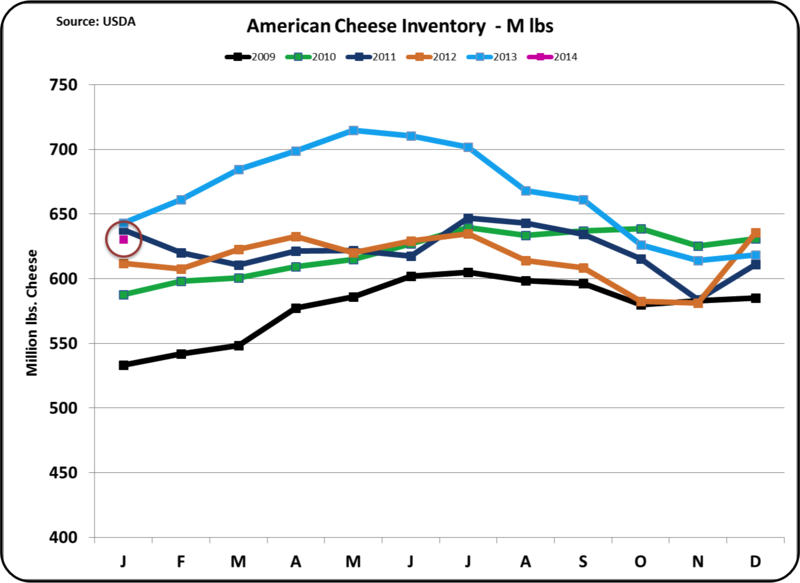 Cheese inventories are near last year's levels with increased production and demand, driven primarily by very strong exports. January cheese exports were up 46% from the prior year. 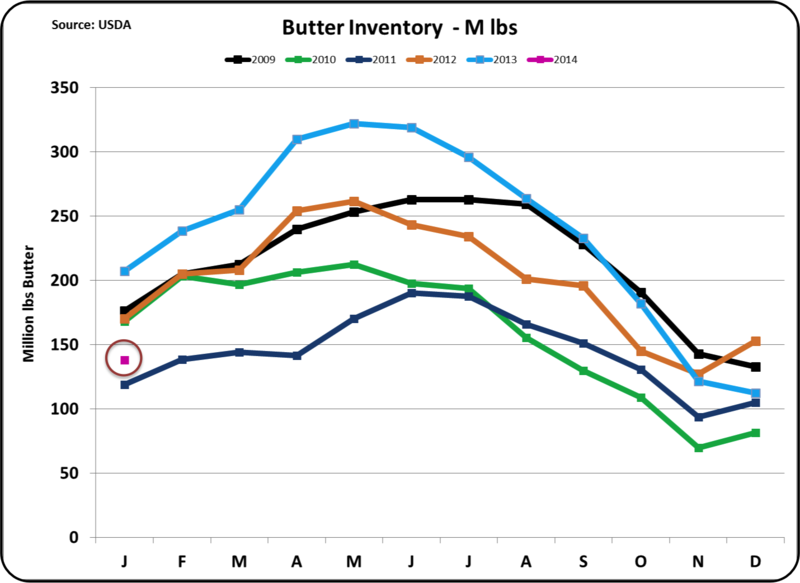 Butter inventories are very low as compared with prior year levels. This has driven the butter price to near record levels ($1.83/lb.). Butter churning remains at normal levels, and the low inventories are driven primarily by exports. January exports were up 150% over the prior year. 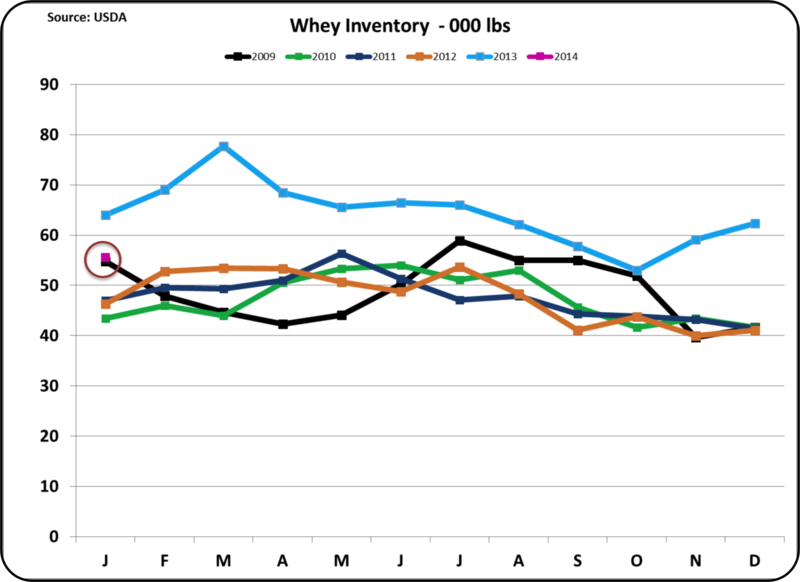 Dry whey inventories have started the year at a lower level than the prior year. This is consistent with the current dry whey price of $63/lb., which is 7% above the 2103 average and 4.9% above the prior month. However, exports of dry whey are below the 2013 pace. This will be followed in future posts to this blog. The scenario continues with the February Class IV price at $23.46/cwt as compared to the Class III price at $23.35. 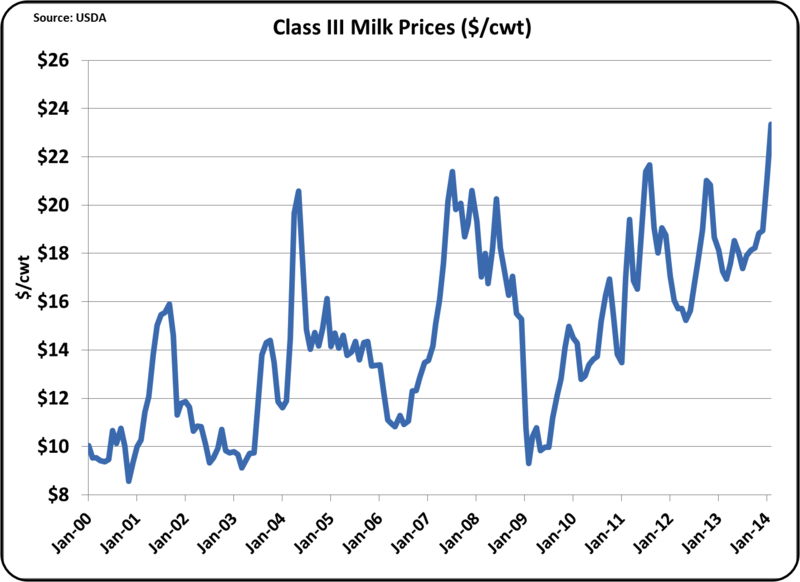 This is continuing to drive higher Class I and II prices (and equivalent California Classes,) which gives a boost to all of the producers selling milk in FMMOs and California. In January, exports of NDM/SMP were below the pace of the last nine months. This will also be followed in future posts to this blog. The current prices are exceptional. This leads to concerns about a bubble in pricing and possible over expansion. This does not seem to be the case currently. Futures prices for Class III and IV milk remain strong and the CME cheese prices are remaining near February NASS prices. The full year of 2014 may not be as strong as February, but it should nevertheless be a good year financially for producers. The Dairy Product Mandatory Reporting Program was transferred to Agricultural Marketing Service about two years ago. We report the weekly data in "National Dairy Products Sales Report"